This year marks a quarter century of Mario Kart. Nintendo's casual racing classic might not boast the painstaking realism of Gran Turismo or the exhaustive and officially-licenced garage of Forza. But the instantly gratifying gameplay, intense focus on multiplayer action and use of some of video game's most famous characters has allowed it to shift over 100 million copies worldwide, with Mario Kart Wii ranking as the best-selling racing game of all time with over 35 million sales. While it might not dazzle in the same way as more serious racing titles, Mario Kart's influence has been felt across the entire genre; here are six ways it indelibly altered the racing landscape forever. One of Mario Kart's trademarks is the power-slide, achieved by tapping one of the shoulder buttons to jump, then drifting elegantly around tight corners. Prior to the release of Super Mario Kart in 1992, racing games had merely toyed with the concept of sliding your car around the tarmac – this was the first time that players had direct control over such an ingenious mechanic. The result was a title that, while easy for inexperienced players to enjoy, offered incredible depth for those who wished to shave seconds off their lap times by mastering this game-changing drifting technique. Namco's Ridge Racer arrived in arcades in the following year and would arguably popularize the power-slide further, but Mario Kart is really where our love affair with the concept began. Those of us old enough to remember the announcement of Super Mario Kart may well recall the intense skepticism felt at hearing that Nintendo's famous mascot would be swapping action-platforming for kart-based racing; at the time, many felt it was a clear case of the Japanese company shoehorning its golden goose into genres he simply didn't belong (although it should be noted that Mario also starred in 1988's Famicom Grand Prix II: 3D Hot Rally, so he did in fact have prior form on the race track). However, history has proven that it was a leftfield masterstroke so typical of Nintendo, and Super Mario Kart not only birthed a 100 million-selling series, but also created an entire subgenre of racers into which rival developers would frantically pour their own efforts. While few of these have been successful in emulating Nintendo's effort, notable examples such as Sonic & All-Stars Racing: Transformed, Crash Team Racing and Diddy Kong Racing came close, and all owe a massive, massive debt to the iconic 1992 SNES release. Mario Kart wasn't the first racing game to combine the idea of speed and weapons – 1983's Spy Hunter performed that trick almost a decade earlier – but it did it better than any other game up to that point, and some would argue that it hasn't been bettered since. The green and red shells used to knock out other players have become part of video gaming's lexicon, while the banana skin – dropped behind your kart in order to obstruct chasing rivals – is equally famous. Meanwhile, who could possibly forget the infamous blue shell, introduced later in the series to become the bane of every race leader? Mario Kart's use of weaponry transformed it from a simple race to the finish into an hilarious yet uniquely tense contest. Without Mario Kart, we wouldn't have Wipeout, Blur and all the other racing titles which include similar armaments. 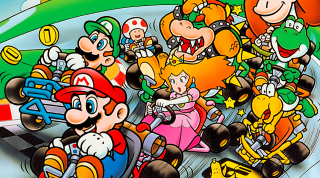 Of course, Super Mario Kart didn't just offer combat racing – it had a competitive Battle Mode which, for many fans, was just as memorable as the circuit-based elements of the game. In Battle Mode, players would be thrust into an arena with the aim of popping all of their opponent's balloons; as the series progressed it was possible to add more players, making this aspect even more compelling. After an unfortunate misstep with Mario Kart 8 – which lacked dedicated Battle Mode levels – Mario Kart 8 Deluxe restored the series to its former glory with some of the most complex levels yet seen, complete with online play. The very first Mario Kart was developed with multiplayer in mind; the game was designed with a split-screen display from the very start, so even when you play solo, the bottom half of the screen is taken up by a map, rather than giving the player a full view of the circuit. This focus on multiplayer was a deliberate move on Nintendo's part, and you could argue that it has informed the direction of the franchise ever since. It's no secret that most video games are more fun when another player is involved, but Mario Kart is perhaps the racing title which truly popularized social play in the racing genre. Mario Kart's real triumph is its accessibility; unlike any other racing series, it takes pride offering wide-ranging appeal to gamers of all ages and skill levels. This has culminated in Mario Kart 8 Deluxe's new assist features, which not only prevent novice players from falling off the edge of the track (something which is already less common as circuits are wider than ever), but also offer automatic acceleration, leaving the player to focus almost entirely on steering and weapon usage. While purists will balk at this pandering to unskilled individuals, such aids mean that every single person in your household can join in with the game, making it the ultimate social racer – continuing a tradition established 25 years ago by the SNES original.